Historians have paid scant attention to the five years that span from the conclusion early in 1848 of Mexico’s disastrous conflict with the United States to the final return to power in April 1853 of General Antonio López de Santa Anna. 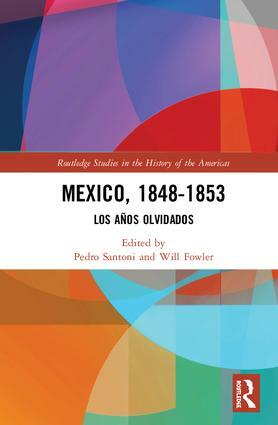 This volume presents a more thorough understanding of this pivotal time, and the issues and experiences that then affected Mexicans. It sheds light on how elite politics, church-state relations, institutional affairs, and peasant revolts played a crucial role in Mexico’s long-term historical development, and also explores topics like marriage and everyday life, and the public trials and executions staged in the aftermath of the war with the U.S.
Pedro Santoni is Professor of Latin American History at California State University, San Bernardino. Will Fowler is Professor of Latin American Studies at the University of St. Andrews.